Last Friday ExA Director Sam Martin visited a site that we have been assisting on for 2 years. The client requested screening for two new london private houses. The houses are overlooked by a 5 storey building. The trees are full height hedge foliage Carpinus betulus and each weighs between 4.5-5 ton. They were supplied by Whitegates Farm Nurseries Ltd in Lancashire from Lorberg in Germany and expertly planted by Kingston Garden Services. 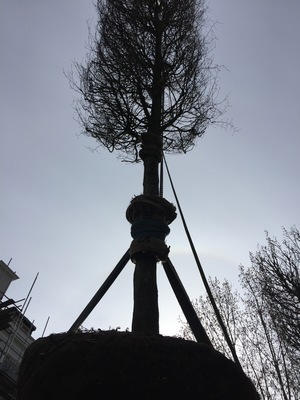 Planting 9 of these trees required some expert tree handling and crane operating skills over a 5 day period with a partial road closure as well.